A spirit-filled King James Version Bible, this attractive hardback is a life filled addition to your bookshelf of nightstand. 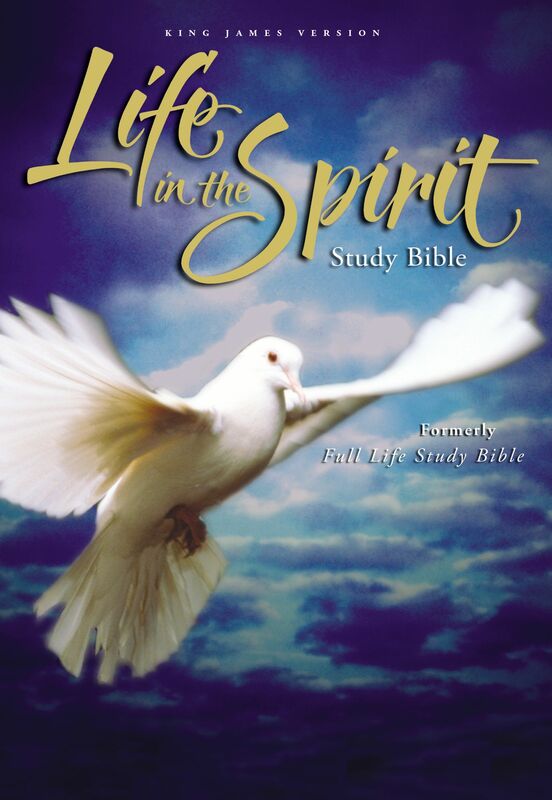 The Life in the Spirit Study Bible will help guide you into a Christ-centered, righteous and Spirit-led lifestyle. Previously titled the Full Life Study Bible, this new edition includes updated and expanded notes, a new word study feature, and a new interior to meet the needs of Spirit-filled Christians today. In a culture that requires believers to depend strongly on God and his Word, this Bible will help you cultivate a deeper relationship with Jesus Christ and the person of the Holy Spirit as the source of the Church?s power. Theme finders - 12 icons located by Scripture passages tell at a glance which theme a given passage addresses. Themes include: Baptized in/Filled with the Holy Spirit, Gifts of the Holy Spirit, Fruit of the Holy Spirit, Healing, Salvation, Witnessing and more. Study Notes - Updated and expanded, extensive notes offer insights that help you understand and apply the Scriptures. Articles - 77 articles address a wide variety of topics surrounding life in the Spirit. Word Studies - This brand-new feature sheds light on the meanings of key words in their original Greek and Hebrew contexts. Charts - 5 custom-designed mega-charts visually portray - Old Testament Prophecies Fulfilled in Christ, The Kingdom of God Versus the Kingdom of Satan, The Gifts of the Holy Spirit, The Work of the Holy Spirit, and The Last Days of History. KJV Life in the Spirit Study Bible: Hardback by Zondervan Publishing was published by Zondervan in February 2003 and is our 11553rd best seller. The ISBN for KJV Life in the Spirit Study Bible: Hardback is 9780310927570. I bought this at a bookshop(before I heard of Eden.co.uk). It is a great study bible - lots of notes, but not dry or theoretical. The profits all go to missionary work, too. The KJV text is lovely and lyrical. Nice big print for tired eyes! The concordance is thorough, and there is also a topical index. This bible is only one recommended on the Assemblies of God US website The articles are a big surprise, so helpful and practical. The author does not dodge the tough issues, but instead gives lots of references and explains everything. Only one beef: the paper is TOO THIN! Got a question? No problem! Just click here to ask us about KJV Life in the Spirit Study Bible: Hardback.